I have been browsing wire prices on ebay. Speaker cable sold in dual wiring seems to be cheaper than wire not described as speaker wire. i see different gauges speaker wire of two lines and sometimes number of strands stated. I see charts indicating how many amps current can travel given distance for different gauges. i see some speaker wire described as for inside walls which has an insulation around the two wires which are also insulated individually. And I see Romex brand wire which is multiple wires within a round or flat insulation. Some wire is described as true AWG, some is not specifically true AWG, and some is simply a number followed by the word gauge and I believe is not AWG specification. I did an analysis of which gauge wire is least expensive by comparing price per foot adjusting for combining higher gauge wire to equal thicker lower gauge wire and whether the cable is a single, double or multiple wire. this dual 12 gauge is cheaper than 1000 feet of dual 16 gauge [.06/twin foot], this dual 16 is cheaper than 100 feet of dual 8 gauge [.43/twin foot]. another consideration is what gauge would I be using. While circuit breakers or fuses offers good protection against overloading wires and overheating them, they are not absolute protection. Both these devices are designed to sense current overloads and to trip or "blow" before the wires can overheat to the danger point. But they are not foolproof, and it is still important to guard against exceeding the amperage rating of any given circuit by plugging too many appliances into them. There is the potential for danger anytime a device or appliance tries to draw more power on a circuit than the wire gauge is rated for. For example, plugging a heater rated for 20 amps into a 15-amp circuit wired with 14-gauge wire poses a distinct danger. Should the circuit breaker fail to operate correctly, that heater will draw more current than the wires can safely handle, and could heat the wires to the point of melting the insulation around the wires and igniting surrounding materials. On the other hand, there is no danger whatsoever by plugging appliances with mild electrical loads into circuits with heavier gauge wires and a higher amperage rating. The circuit will draw the power asked for by whatever is plugged into them and no more. So, for example, running a laptop computer with a very small amperage demand on a 20-amp circuit wired with 12-gauge wire is perfectly fine. The potential for danger is most pronounced with the use of light household extension cords. Many a household fire has occurred when a light extension cord with 16-gauge wire is used to power a heater or heating appliance of some sort. Most manufacturers will discourage the use of any extension cords with portable heaters, but if one must be used, it has to be a heavy-duty cord with a high amperage rating that matches the amperage of the appliance and of the circuit it is plugged into. What I am not learning is whether dual wire speaker cable can be used for 110v AC and 12v DC projects when current is within specification. Last edited by jayboydog; 07-13-2018 at 11:39 AM. In general usage, stranded wire is used in audio and and solid wire is used for 110VAC. But this is not cast in concrete. You can use stranded wire or solid wire for any application you choose. In general, wire is wire. Stranded wire is more flexible, making it easier to run around corners and stuff like that. If you look at a car's wiring, it is stranded. Solid wire is cheaper. Speaker wire is marked as such for convenience. It is a pair of wires molded together with one side marked so you can easily maintain polarity. It is usually in a clear insulation as a way to make it look prettier because a lot of time it is visible to people. You could use lamp cord if you want, I have lot of times. Insulation has its own considerations. What is the environment will it be used in? The 2 basic divisions are indoor and outdoor. Wire exposed to sunlight should be UV stabilized to prevent it from hardening and cracking up. Wire used in a plenum chamber or an air duct needs to made of a material that will not give off toxic fumes if it should burn. The gauge of a wire should always be thick enough to carry the amperage require by all the devices attached to it. You gave an example of an electric heater that uses 20 amps being plugged into a 15 amp circuit. If said circuit was wired in accordance to the National Electrical Code, you should not even be able to plug it in. If someone changes the plug on the heater so they can plug it into a 15 amp circuit, they will get the just reward they deserve, hopefully before they have reproduced. My only hope is that they don't live in an apartment building. Your questions about the terminology used by the various sellers of wire regarding wire size or gauge. Most people will say gauge instead of AWG. I have never come across wire that was not AWG, but maybe the stuff from China does not conform to the standards. As for the term true AWG, I have never noticed that and I think it is probably advertising BS. 16 AWG can handle 13A. I plan to use 12v power supply and two step down converters pictured to send 5v 1A to 3.7v batteries. I may connect TEN Batteries EACH DRAWING 1A adding together 10A to a 16 gauge wire. And join THE 16 gauge wire at the converter output. 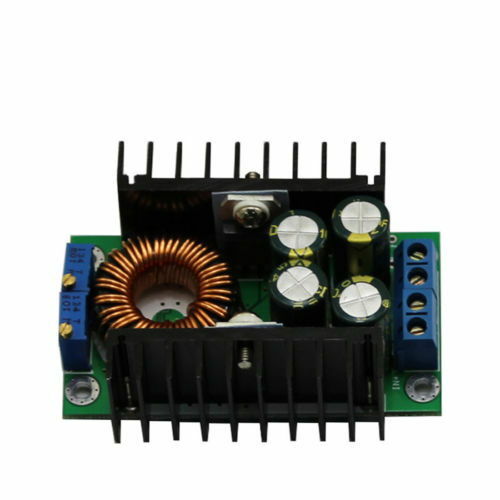 The power supply can deliver 29A (350w). I believe the draw of the power supply from the wall socket assuming 80% efficiency would be 131.62w (120v 1.10A). Last edited by jayboydog; 07-12-2018 at 01:25 AM. How many volts is 6500-6600rpm? MA audio amps vs. phoenix gold amps vs. jl amps?